This venue is the most favorite of sports fans in the city of Duluth and it is The Arena at Gwinnett Center. This is a multipurpose arena that caters to a number of sports games. Every season thousands of people attend their favorite games. In the last few years a number of famous events have taken place at Gwinnett Center. You not only can watch your favorite sports teams in action here but also listen to some great artists and bands as this center also hosts musical concerts. You can get The Arena at Gwinnett Center tickets at your earliest to enjoy events here. The Arena at Gwinnett Center is located in Gwinnett County on 6400 Sugarloaf Parkway in Duluth, Georgia. Construction of this venue started in 2001 and it eventually opened for public in early 2003. It is an amazing building that was designed by Rosser International and constructed by Holder Construction Company. The venue is owned and operated by Gwinnett County Convention Visitors Bureau. The arena is famous for hosting ice hockey and basketball games as well as concerts. The average capacity of this center is around 13000. It is home to two popular sports teams namely "Gwinnett Gladiators" that play in the East Coast Hockey League and the "Atlanta Steam" that plays in the Lingerie Football League. Since opening in 2003 a number of famous sports events have taken place at The Arena at Gwinnett Center. Right after opening the first ever game played here was an arena football match that featured Georgia Force. Since then extremely popular sports events have taken place here like Georgia High School Basketball State Championships, SEC Women's Basketball Tournament and 2013 WNBA Finals. The Arena at Gwinnett Center is also famous for its extreme sporting action bouts such as Bellator 88: Shlemenko vs Falcao MMA, WWE Smack Down, Georgia High School Wrestling, WWE Raw, WWE Armageddon, TNA Bound for Glory and TNA Impact Wrestling. Another unusual sporting event took place here in 2009 and that was Professional Bull Riders Challenge Tour Championship. This event was part of the Built Ford Tough Series. One exciting music event that will soon be taking place here is called Star 94 Jingle Jam. This concert will be featuring immensely popular artists like Backstrret Boys, Goo Goo Dolls, Avril Lavigne, Colbie Caillat and The Fray. Wrestling events are one of the most popular sports shows that regularly take place at the Arena at Gwinnett Center. You have been watching your favorite concerts and teams live in action at this arena in the past but it is advisable that you get ready for the upcoming array of exciting events that will be taking place here. 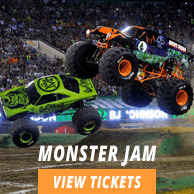 Check out the event calendar now so that you can book The Arena at Gwinnett Center tickets. The average The Arena At Gwinnett Center Tickets price will cost you between $95 and $596, if you are looking for the cheapest seats then catch the event being held at the Infinite Energy Arena, Duluth on 25/04/2019. The average ticket will cost you the highest on 28/09/2019 at the Infinite Energy Arena, Duluth. Minimum get in price is for The Arena At Gwinnett Center Tickets is $30 for the event being held at the Infinite Energy Arena, Duluth on 19/06/2019 , there are some venues that have a much higher get in price, for instance the cheapest seats at the Infinite Energy Arena, Duluth on 28/09/2019 will set you back $193. How will you deliver my winet arena de atlanta tickets to me? How long does it take to get discounts after using discount code gwinnett arena tickets? where is row q in gwinnett center arena? Are the prices of arena gwinett tickets negotiable? You must browse our index for the venues, the page for The Arena at Gwinnett Center has its address an related information. You can get instant discounts after using the discount codes provided for The Arena At Gwinnett Center Tickets. Your Tickets will be delivered to you through a very reliable and well reputed courier company.